Some of my workers are reporting that the submissions are not showing up on the Auto Responder 1. It is supposed to be sent to the form field "email" but only about 50 percent of them are not showing up. So far, I am only aware of a problem with those e-mails being sent to Yahoo. The weird thing is that it is only part of them that are not showing up. I have checked the worker's e-mail setting and made sure that they were not being sent to spam, and made sure that I was on her contact list. Still only one of the two that I submitted with her showed up in her Yahoo E-mail account. 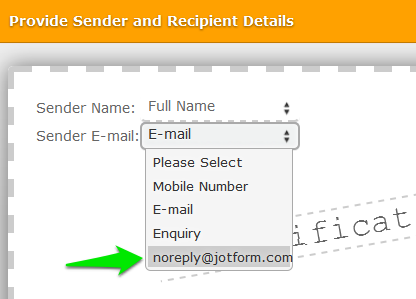 Your form was lacking of a "From" email address (Sender Email), as it only was showing "Please Select"
So I went ahead and changed it to noreply@jotform.com for both the Autoresponder and the Notification.